NEW: Juliette Has A Gun - Sunny Side Up For Women! Thread: NEW: Juliette Has A Gun - Sunny Side Up For Women! Sunny Side Up by Juliette Has A Gun is a Floral Woody Musk fragrance for women launched in 2017. The nose behind this fragrance is Romano Ricci. Base notes are ambrette (musk mallow) and iso e super. 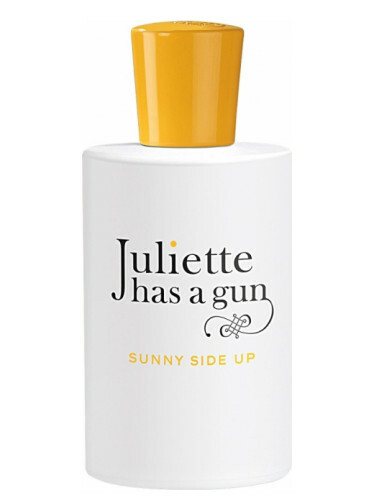 Re: NEW: Juliette Has A Gun - Sunny Side Up For Women! Thanks for the info, Hednic. The eggy name though, is a real turn-off for me. I like JHaG very much. Their playful and whimsy marketing may push people away from the brand because they may not be seen as taking themselves and perfumery serious, but some of the house's scents - Lady Vengeance (probably my fave rose-patchouli combination ever), Citizen Queen, Miss Charming, Calamity Jane and Oil Fiction are just plainly put fantastic. Shame they don't do any masculines (though a lot of their offering is easily unisex). Anyway, I'm looking forward towards trying this out. Make no mistake: this scent is VERY woody sandalwood. Despite the marketing (think Elizabeth Arden Sunflowers), this is not a floral scent by any means. It is light, pleasant and woody. Sandalwood lovers, take note! The JHAG company has an Instagram marketing set of images. I wonder if the French know the expression, "to have egg on one's face." I had the chance to try this yesterday and liked it very much. It's a very soft, musky, slightly sweet sort of scent that kind off smells like 'skin but better'. Perfect for casual outings or lounging around the house. Or a perfume for people who don't like perfume. Don't dismiss it just because of the name and bottle. I also loved it. I was very surprised, since I am not a big fan of the JHAG line (I owned a decant of Midnight Oud at one time or another but that's it). Def a nice creamy tropical sandalwood scent. I look forward to getting a decant of this, if I can. Anything that men should try from the women's side of the isle? Any 5 STAR scents on the ladies' side? Not UNISEX, but for women. YVES SAINT LAURENT side-by-side review: yesterday and today.